People always tell me I have my head overloaded with information technology and communications. That should be the place to say that first of all note that these are two different subjects. Things could have been much worse if I only had my head busy with have my head overloaded with information technology or with communications, so its not like I always think about a single “theme”. Furthermore, the above is absolutely inaccurate. I am deeply interested about other things as well. Solar Thermal Energy for example. In the 80’s there was this small yet successful Israeli company called “Luz”. they were making hi-tech glass when no one really knew what it even was. 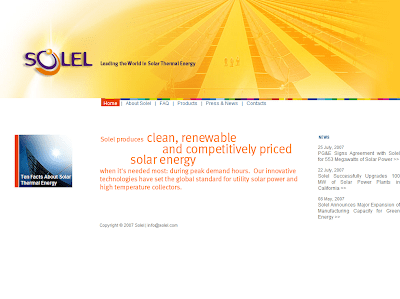 Then in the early nineties it was more-or-less shut down and reborn as Solel Solar Systems Ltd. (“Leading the World in Solar Thermal Energy”) which over the last 14 years invested their resources in improving the yearly electrical output of parabolic trough solar fields and in reducing their installation, operations and maintenance costs. According to the Israeli financial paper Globes, Solel will sell 553 megawatts of electricity to California’s PG & E Corp. (Pacific Gas and Electric Company) from a solar power plant that the company will build in the Mojave Desert at an investment of some $2 billion. PG & E’s nine-square mile Mojave Solar Park is due to begin operating in 2011. PG&E said that the power, enough for 400,000 homes, will go to customers in northern and central California. BTW, sun is not the only thing Israelis make electricity from. We also help reducing humanity’s carbon Footprint by making electricity from Biogas from Cow Dung (that’s a Hebrew reference) very close to where I live. This entry was posted on July 30, 2007 at 1:46 am and filed under carbonfootprint,electricity,energy,enviroment,howto,news,power,review,save. You can follow any responses to this entry through the RSS feed. You can leave a response, or trackback from your own site.